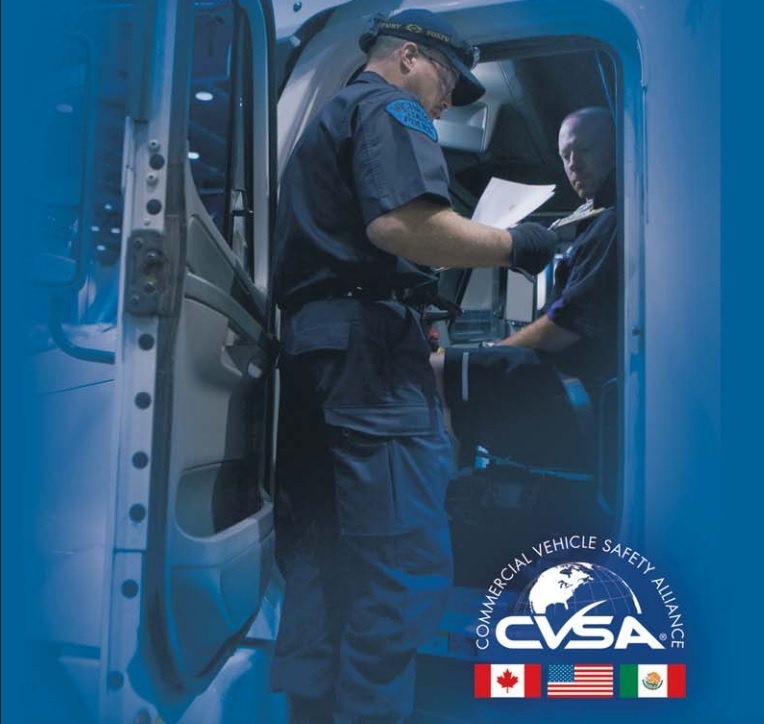 This week marks the CVSA’s 2015 Operation Safe Driver Week which runs October 18-24. The goals of Safe Driver Week include increasing vehicle traffic enforcement, safety belt enforcement, driver roadside inspections and driver regulatory compliance, all aimed at pinpointing unsafe driving behaviors. 392.2S Speeding may result in up to 10 CSA Severity points, depending on the speed and/or location (school or construction zone, etc.). 392.16 Failing to use seat belt while operating CMV has a Violation Severity Weight of 7 points. 392.2LC Improper lane change and 392.2FC Following too close can result in 5 points each. 392.2C Failure to obey traffic control device is pegged at 5 points. These types of infractions are considered Dangerous Driving and a number of these violations will result in a company’s Unsafe Driving BASIC to be flagged with an Alert. Don’t wait for the DOT to flag your CSA scores. Unsafe Driving violations are considered problem driver behaviors by the DOT. But it’s not the DOT’s problem. Review your CSA scores, safety and performance data. If you have repeated bad players with bad driving habits on your team, they need to change their problem behaviors. Like right now . . .
There’s one rule in trucking: keep the wheels moving. If a truck is stopped or disabled on the road or even on the side of the road, it can become a road hazard and, as such, the driver has a duty to warn motorists of its presence. Failing to use hazard warning flashers §392.22(a) is one CSA Violation Severity point for Unsafe Driving. This citation is often paired with Failing/improper placement of warning devices §392.22(b) which racks up two more CSA Violation Severity points. Trucking companies and other motor carriers are racking up dozens of CSA points by drivers positioned on the side of the road or in a breakdown lane without using their hazard warning flashers or properly placing their warning devices (such as safety triangles). As Indiana Jack points out in his video, he, too, has noticed improper placement of warning devices. (a) Hazard warning signal flashers. Whenever a commercial motor vehicle is stopped upon the traveled portion of a highway or the shoulder of a highway for any cause other than necessary traffic stops, the driver of the stopped commercial motor vehicle shall immediately activate the vehicular hazard warning signal flashers and continue the flashing until the driver places the warning devices required by paragraph (b) of this section. The flashing signals shall be used during the time the warning devices are picked up for storage before movement of the commercial motor vehicle. The flashing lights may be used at other times while a commercial motor vehicle is stopped in addition to, but not in lieu of, the warning devices required by paragraph (b) of this section. 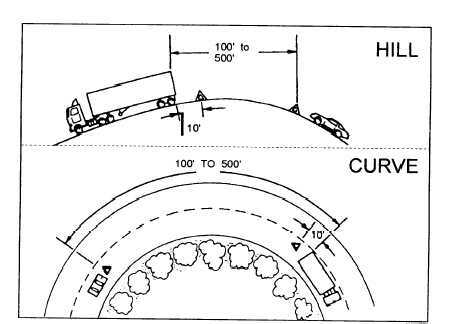 The above diagram appears in your state’s CDL manual. The regs say the warning devices should be placed within 10 minutes of the stop. 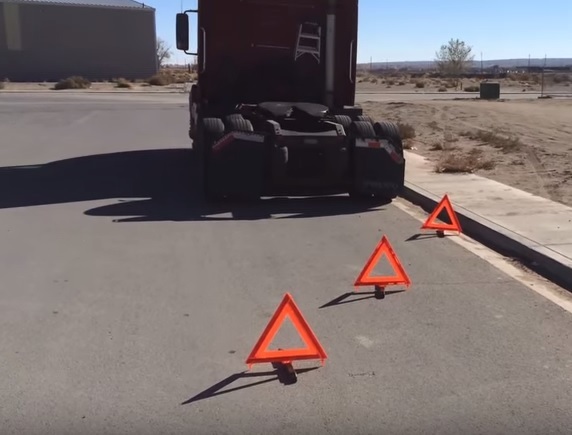 The reality is that safety triangles should be placed as soon as the vehicle is secure (brakes are set), especially at night or near well-lit backgrounds which can obscure a truck. Half-awake or impaired drivers have a tendency to line up with the vehicle ahead, often with tragic results. So put on the emergency flashers and get those warning devices out there any time your commercial vehicle is stopped on or next to the roadway. Ensure drivers put on their hazard warning flashers and properly place their warning devices, if stopped on, next to, or near the roadway. Ensure every commercial vehicle (over 10,001 pounds GVWR or 26,001 pounds GVWR, depending on your state) has at least three warning devices as safety triangles secured in the cab or on the vehicle. Review with your drivers the regulations, company policies and driver’s manuals for §392.22 requirements on a periodic basis. Thanks for reading this. Have a safe day. What is the one safe driver behavior every driver should do every time they drive? • In a rollover, a truck driver is 80% less likely to die. A Stockton, CA truck driver lost control of semi-truck and was killed. 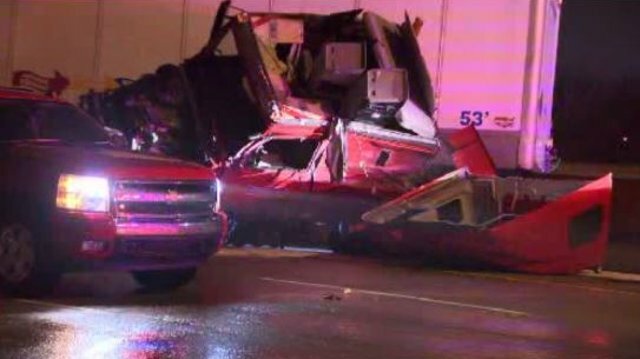 Three Chicago-area movers were killed on a rain slicked road when their semi-truck jackknifed. In fact, 35 percent of the truck drivers who died in 2012 were not doing this. In the epoch of CSA, high insurance cost, and other associated costs of high-risk behaviors, who can afford such drivers? Yet if one looks at the CSA Violation Summary of any organization or company pulled at random, they will generally find several citations for not doing this life-saving safe driving behavior— sometimes multiple citations for the same risky behavior. Why don’t drivers do this? Are only travelling a short distance. “Feel safe” in a big rig. No body will catch them. Implement a written safety program. Keep reminding drivers that they are required by federal regulations to do this and it is part of the job they signed on to do. Provide job coaching and counseling for errant drivers. As a last resort, use progressive discipline. Don’t settle for substandard behavior. If one looks at their organization’s CSA Violation Summary, the list generally starts off with “Unsafe Driving” violations. Unsafe Driving is one of the six CSA Behavior Analysis & Safety Improvement Categories (BASICs). Unsafe Driving violations vary from “392.16 Failing to use seat belt while operating CMV” (essential to maintain control of a vehicle), to “392.2Y Failure to yield right of way” (the leading cause of fatal crashes), to “392.82A1 Using a hand-held mobile telephone while operating a CMV” (a factor in up to 25% of all crashes). In short, Unsafe Driving violations get to the crux of safety. By definition, the unsafe driver is operating unsafely. The unsafe driver listing varies by company from zero violations to dozens, some reoccurring again and again and again. Congrats, if no such violations are listed on your CSA Violation Summary. Turning a Blind Eye . . .
An organization’s culture is how it gets things done. Safety culture is the reflection of attitudes, beliefs, perceptions and values that employees share in relation to doing things safely or as safely as possible (free of risk). The concept of “willful blindness” originated in criminal law in the nineteenth century. One becomes willfully blind when there is knowledge that they could have had and should have had, but chose not to have, in order to evade responsibility. I know there are companies that do not actively check their CSA scores. Sometimes they are not aware of CSA. In some situations, they have never been inspected by the DOT and have nothing to see. 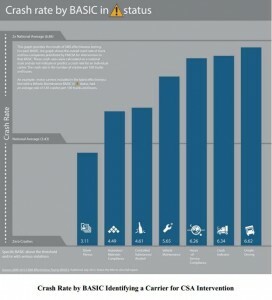 The most common excuse I hear is that resources are lacking. And it’s true, there is never enough time in the day when you are pulled in ten different directions. If so, then it’s time to prioritize and put safety-related activities back on the top of the to-do list. Everyone should check their CSA scores to at least make sure that there are no DOT violations which were mistakenly listed. You can bet the insurance company will check the CSA scores when it comes time to set the premium. 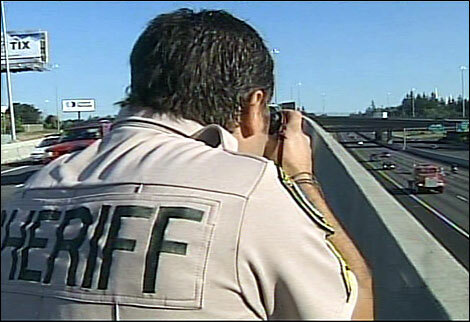 There is no secret to eliminating Unsafe Driving violations. The Federal Motor Carrier Safety Administration has published a helpful brochure on this called, “Safety Management Cycle for the Unsafe Driving BASIC.” You may not agree with all of its suggestions, but this is a good place to start. Driver coaching is effective in changing unsafe behaviors. According to a study by Teletrac, up to 40% of drivers change their behavior after their first safety warning. Telematics can provide real time information on safety events as harsh acceleration or braking (when more force than normal is applied to the vehicle’s brake or accelerator), harsh cornering (the coffee-cup test— if the driver is cornering fast enough to spill a coffee cup, then it’s too fast of a turn), and speeding. Accident Event Recorders capture safety related events, both in front of the vehicle and/or inside the cab, with video technology. Insurers may offer a discount for their use. Pay attention to reports from the general public. At times, the reports may be unwarranted or unjustified. Look for patterns of unsafe driving behavior. Set your own standard of safety. Ex. One large motor carrier bans all U-turns. Finally, do not tolerate any Unsafe Driving. Vehicles are much larger, roads are congested and on some days, it’s really crazy out there. Taking unnecessary risks or turning a blind eye to those who do, invariably leads to unintended consequences . . . usually of the negative sort. Idealease offers a free one-day Idealsafe Safety Seminar, co-sponsored by the National Private Truck Council (NPTC), to all customers and prospects. This year’s seminars will focus on basic safety and compliance, regulation changes and of course, CSA. How do I get my CSA scores down? On December 10, 2010, a pilot enforcement program known as Comprehensive Safety Analysis 2010 (CSA 2010) was relaunched nationally and became Compliance, Safety, Accountability or more commonly, CSA. The heart of CSA is the Carrier Safety Measurement System (CSMS). Another part is the Driver Safety Measurement System (DSMS), which measures the safety of individual commercial motor vehicle (CMV) drivers. The Driver Safety Measurement System is designed to identify drivers with a history of safety violations. The information is used to target enforcement when an investigator visits a motor carrier during a compliance review or other intervention. This information is not provided to the public. The SMS is based on available roadside safety performance data. 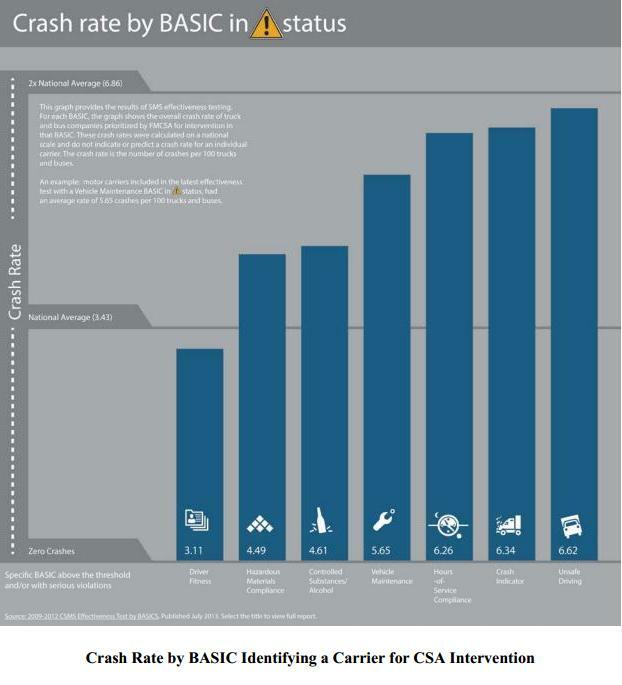 This roadside data is used to rank operational safety in six Behavior Analysis and Safety Improvement Categories (BASICs) and a crash involvement (Crash Indicator). 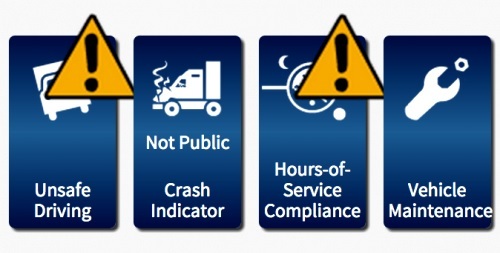 Law enforcement may use rankings within these BASICs and the Crash Indicator to select organizations for further investigation or selection for additional roadside inspections. As this information is public (except for the Crash indication), anyone including shippers, insurance carriers, job candidates, etc., can look at the BASICs as well. If a certain score (or threshold) is passed, the basic may be flagged. Flagged BASICs can result in DOT Audits or investigations that can last from several hours to several days, or even weeks, depending on the size of the fleet and the scope of the investigation. If any regulatory discrepancies are discovered during an audit or investigation, the DOT can respond in a number of ways ranging from fines, to issuing a downgraded safety rating, or “orders” to comply or to develop a safety plan. Essentially, the results of every Roadside Inspection (RI) are important because the safety performance data from the inspection can affect the BASIC or CSA score. 2. Have a process in place for immediate repair of any vehicle safety defects or faults. A successful maintenance program should be 80% proactive or preventative, and 20% reactive. Catch problems when they are small and manageable. 3. Make sure your driver(s) understand Hours of Service rules and regulations (Part 395). 4. Make sure drivers are well-rested and alert when they drive. 5. Hire well. Do good background investigations and drug and alcohol testing, if required. Road test drivers before hire and do driver check rides at least annually. 6. Have a set of written standards for your fleet. Document driver and vehicle expectations. Provide drivers with safety training, manuals, guides and training. Monitor driving performance and give feedback when necessary. 7. Learn and know the DOT regulations. Know what the regulations expect of you and your team. Then communicate your expectations, on a daily basis. Organizations with low CSA scores do all of the above and more. Will you “qualify” for a DOT Audit? Carriers targeted for enforcement, due to their Vehicle Maintenance BASIC, the fourth bar in the graph, had a average of 5.65 crashes per 100 trucks and/or buses. If your BASIC is flagged and your company has had a higher than average crash rate, then expect some sort of response from the DOT, up to and including an audit. Audits may be unannounced. Note: most fleets don’t have hundreds of vehicles. One or two crashes may be enough to trigger a DOT intervention for a smaller fleet. Source: From The Carrier Safety Measurement System (CSMS)Effectiveness Test by Behavior Analysis and Safety Improvement Categories (BASICs) report, dated January 2014.